In highschool a friend caught me off guard when she said with confidence that “once you’re saved you can’t lose your salvation.” I asked her where the Bible said that; she didn’t have an answer. Instead she just insisted it was true; her minister said so. “Once saved; always saved,” she spouted. She was as sure of that as her own name. She had prayed a prayer asking Jesus into her heart and that was all that mattered. End of discussion. I worried about her conclusion and her eternal destination. I implored her to not treat something so important with casual indifference. She began acting less and less like someone who followed Jesus. I watched as she turned and walked away from him. Before long she was talking and acting like someone who didn’t know Jesus at all. She believed she had her eternal get-out-of-jail-card, and nothing else mattered. People who study such things call “once saved, always saved” the “doctrine of eternal security.” Grabbing a spattering of carefully selected Bible verses they build a case for their conclusion. I’ve spent time with such people who consider eternal security as an unquestionable, absolute truth. I kind of see their point but think the evidence they present is far from conclusive. I’ve also spent time with people equally convinced that the principle of eternal security is an errant conclusion. They have their own verses to support their contention. I kind of see their point, too, but I think the evidence they present is far from conclusive. When my wife and I married, we agreed it was for the rest of our lives; divorce would not be an option. However, each day we also make this decision again. We choose to remain committed to each other and love each other. Most days we do this well and other days, not so well. Yet in each of these days we move forward as a married couple. Only a fool would claim that saying “I do” one time at a wedding ceremony was enough and that actions from that day forth mattered not. So, I choose to say “I do” every day to my wife. I do the same with Jesus, too. Each day I say “I do” to Jesus again; I choose to follow him anew. I’d be foolish not to. 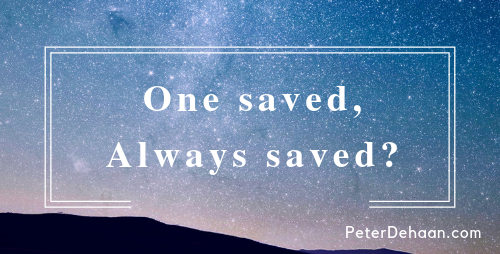 What are your thoughts on “once saved, always saved?” What do you do to say “I do” to Jesus every day? Great post! An eye opener for all Christian’s to be prepared to be questioned about God’s word. As a believer should know, salvation is not earned. It is a free gift from God. In Ephesians 2:8-9 says,”For by grace you have been saved, through faith. It is not by works so no man can boast.” So how can we lose our salvation if we didn’t earn it? The Bible clearly indicates many scriptures on salvation however, it is not going to say, verbatim, about losing your salvation. It’s a shame that when one become saved, most think that is the ticket to heaven and don’t think twice to live out their lives pleasing God and building His kingdom. Those that walk away from God clearly must not have been genuine in accepting Him as their Lord and Savior. We can sometimes stray but God puts us back on the right path when we show conviction which leads to repentance. May God continue to bless you and your gospel in Christ Jesus.